NEW DELHI: In recent times, the Indian Air Force has witnessed swift expansion with a comprehensive modernisation drive being undertaken to acquire multi-role capability platforms and weapons, along with multi-skill capability of its personnel. The IAF is now gearing up to induct the 290-km range supersonic BRAHMOS cruise missile after it was successfully inducted in the Indian Army and Navy. Precision weaponry has revolutionised contemporary warfare by multiplying the effectiveness of using air and ground power together. The air-launched BRAHMOS missile system will be a lethal strike power in IAF's arsenal. The BRAHMOS is a state-of-the-art weapon system having no competitors till date. After proving its prowess with unmatched speed, precision and power, in land and sea both, BRAHMOS air-launched version is getting ready to be test-flown from the Su-30MKI fighter aircraft of the IAF. The Su-30MKI armed with BRAHMOS missile is a combination of lethal strike with the ability of air fighting within and beyond the visibility range. It will provide IAF with the capability of attacking targets protected by powerful air defence assets, including aircraft carriers. The air-launched version of the BRAHMOS missile is under progress and the first test-firing is expected to take place either by the end of this year or in the beginning of next year. 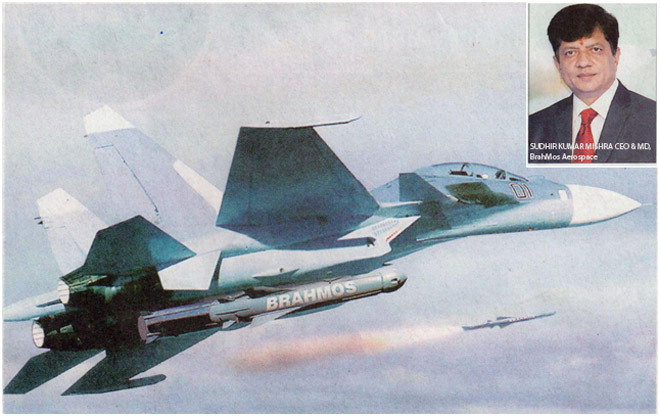 Sudhir Kumar Mishra, CEO & MD of BrahMos Aerospace, has stated that BrahMos Aerospace will begin delivery of the air-launched version of BRAHMOS missile system to the IAF by 2016. The air version of BRAHMOS will be lighter than its other variants and will weigh 2.5 tonne, though it would be equally potent in firepower and devastating capability as its range and maximum speed of 290-km and 2.8 Mach respectively will remain unchanged. The weight of the 3000-kg missile has been reduced by half a tonne so as to be integrated on the Sukhoi fighter which can carry a maximum payload of 8,000-kg. BrahMos Aerospace is closely coordinating with HAL, the Indian Air Force and its Russian partners to ensure that the maiden trial of the BRAHMOS air-launched version takes place at the earliest as deliveries will commence from 2016. The arming of BRAHMOS on Su-30MKI will dramatically enhance IAF's capability for neutralising seaborne as well as land targets far from boundaries. The combination of the strike fighter aircraft and supersonic cruise missile will together give the IAF tremendous combat potential.